What is Grizzly Pollock Oil Dog Food Supplement? 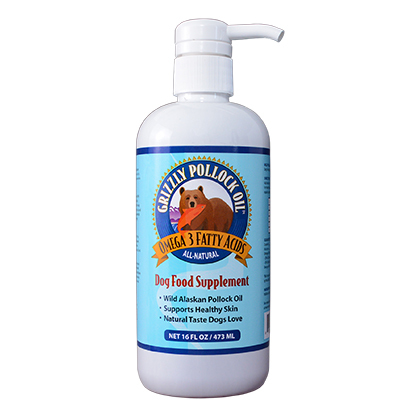 Grizzly Pollock Oil Dog Food Supplement is all-natural and derived from sustainable Alaskan pollock fish. It helps promote healthy skin and coat by providing Omega-3 fatty acids. The high Omega-3/6 ratio of Grizzly Pollock Oil is close to wild salmon oil in efficacy, while being far superior to that of farmed salmon oil. 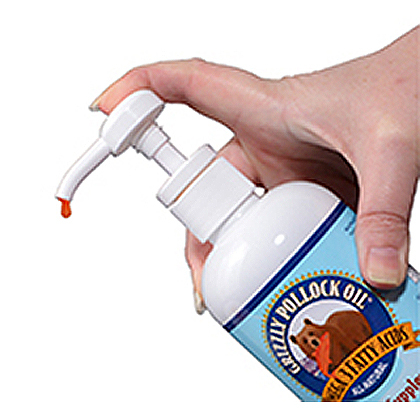 Grizzly Pollock Oil Dog Food Supplement comes in a convenient pump bottle making it easy to add to your pet's food. Grizzly Pollock Oil Dog Food Supplement contains a high Omega-3/6 fatty acid ratio, to support healthy skin and coat, as well as joint and cardiovascular health. Add to your dog's food daily according to the weight chart below. One pump stroke equals approximately 0.12 fluid ounces / 3.5 ml.